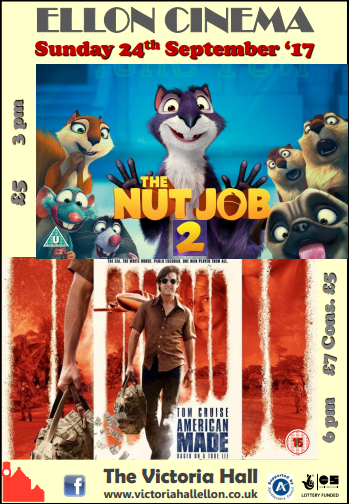 Ellon’s community cinema team will be back in action again on Sunday! Tickets can now be purchased online for all films by visiting www.victoriahallellon.co.uk/cinema or at the door on the day. Reservations can also be made via the Ellon Cinema Page on Face Book. This is recommended especially for large parties. Surly and his friends, Buddy, Andie and Precious discover that the mayor of Oakton City is cracking one big hustle to build a giant yet quite-shabby amusement park, which in turn will bulldoze their home situated in the city park It’s up to them and the rest of the park animals to stop the mayor, along with his daughter and a mad animal control officer from getting away with his scheme, and to take back the park. American Made (15) – 6 pmBarry Seal (Tom Cruise) a TWA pilot, is recruited by the CIA to provide reconnaissance on the burgeoning communist threat in Central America and soon finds himself in charge of one of the biggest covert CIA operations in the history of the United States that spawned the birth of the Medellin cartel and eventually almost brought down the Reagan White House with the Iran Contra scandal.